This is the first of hopefully many “sneak peeks” into the LifeWays training program. Our aim is to offer you a glimpse of what happens within the training, what happens to those having gone through the training, and also to offer a reason for why we hope you too will sign up for the next LifeWays training near you! Enjoy. A year ago, at ten o’clock on a Monday morning, I stood with a group of adults I didn’t know around a conference table in a sunny room in Milwaukee, Wisconsin, watching our teacher Mary O’Connell. She took an apple out of a paper bag and plopped it down in front of her. I had flown eight hundred and sixty miles for this. My young son was with his grandparents, my husband had arranged his work schedule to accommodate the week, and my life was changing more than I ever could have imagined. 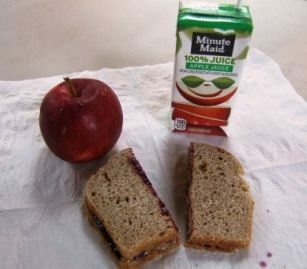 Mary then took out an almond butter and jelly sandwich and tossed it beside the apple, still in its plastic wrap, and then plunked a juice box down too. We all stared. “Lunch, right?” she said. We nodded silently. I thought about how much I wanted to eat that almond butter sandwich. Mary then unwrapped the sandwich, put the straw into the juice box, spread a paper napkin out like a placemat, and carefully arranged everything on it. “Better?” she asked us. Yes, very much. But wait. She then took out a cheerful yellow cloth napkin, unfolded it with reverence, gently lifted the sandwich onto a white ceramic plate and centered it on the new placemat. 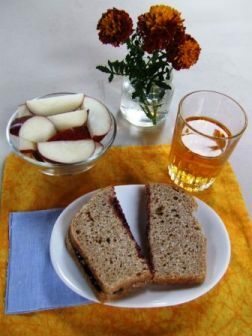 She poured the juice into a small glass, lovingly tucked another child-size cloth napkin under the plate, and, piece de resistance, finished with a little cup of fresh-cut flowers. We all smiled. We looked at each other. We smiled some more. This made sense. This was good. This is how we could start to change the world. That week in our LifeWays training sessions, we learned a radically different way of thinking about childcare and parenting. We crawled on the floor to remember how the infant experiences movement, so we could design our homes and rooms with empathy for this natural process. 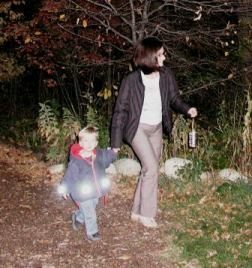 We talked about the important role of awe and hope in a child’s life as we dipped balloons in glue and tissue paper to make dancing lanterns for an evening walk with local families. We listened intently to lectures about child development, media, health, nature and play. We took notes and raised our hands and questioned and talked and talked and talked, and I began to understand that this was a profound new way to approach not only children professionally, but my own family, my own parenting, and—most unexpectedly—my own self. I felt myself relax as my body unwittingly exhaled. I noticed others around me did the same. I wrote the words in my notebook and waited for Cynthia to speak again, looking out the window as I did at the woods behind her, the river sparkling far below. “How do I warm my environment lovingly, but not smotheringly?” She paused and smiled. I thought of my tendency to helicopter parent, how I have ruefully noticed in the LifeWays Centers how much confidence the children have when their caregivers let them follow their own instincts, standing back yet surrounding them with safety and thoughtfulness and care. “What in your daily life with children is steadfast, constant and predictable, and what in your own life fills your cup?” I flinch a little at “predictable,” as our life is certainly anything but. It is the “cup” that touches me, though. With those words, I suddenly “get it” – I get how the real work here, the deep work that has to be done, to build a childcare center, to raise my son, to do the ministry I love, to tend to my family, is in me. I have to set my own lunch table for myself, every day, with warmth and beauty and reverence, take deep breaths, tap into this love of the world and bring it out to all those around me. It’s a tall order. As I write this morning, which makes me happy, I am not getting breakfast ready. I look at the clock. My son is still sleeping and we will be late for school—again. I am caring for myself a little better these days, but then I lose the balance with family time. I am still learning. But I do light a candle for the few minutes we all manage to get around the meal table together. I am trying this year to have more flowers in the house, to have shoes and coats organized by the back door, to spend afternoons with my son and his friends outside in the new vegetable garden, and to give everyone a little more space. After the lesson that day, Mary did let me eat that almond butter and jelly sandwich, but she and Cynthia and all the other teachers fed and nourished me in ways I am still realizing. This is big lifelong work, hard work for many of us new to it, but so hopeful, and so important. Bon Appétit! Cindy Matchett is a LifeWays trained, interfaith ceremony specialist, creating personal rituals for families at periods of transition such as welcoming a baby, blessing a new home, recognizing an achievement, saying goodbye, or starting a new phase in life. She and her husband live outside of Boston in an old schoolhouse with their son where they are learning more about parenting every day. To find out more about Celebrant ceremonies, contact her at www.meaningfulcelebrations.com or www.meaningfulweddings.com. Love ly ~ * Wonder full ~ * Delicious ~ * Nutritious ~ * ever – . . . and my waldorfian child is now 25, and I live this way still, every moment that I can ~ and yet…….still, ever-nourishing well-spring of be-ing, this conversation; this community. Delighted that I happened upon this site from Lisa Boisvert’s site.